Synopsis: The International Tables for Crystallography are jointly published with the International Union of Crystallography. Each print volume can be purchased individually. In addition the complete set of Vol A-G is available both in print and online (see right hand column). 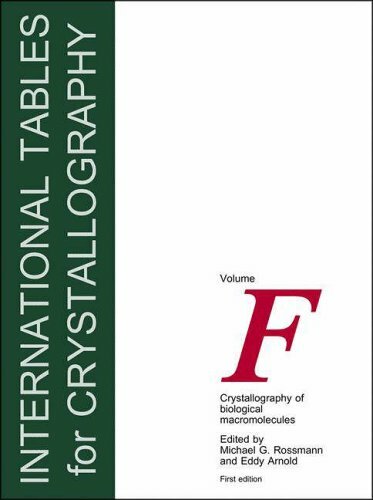 International Tables for Crystallography, Volume F, Crystallography of biological macromolecules is an expert guide to macromolecular crystallography for the modern structural biologist. It was commissioned by the International Union of Crystallography in recognition of the extraordinary contributions that knowledge of macromolecular structure has made, and will make, to the analysis of biological systems, from enzyme catalysis to the workings of a whole cell, and to the growing field of structural genomics. The volume covers all stages of a crystallographic analysis from the preparation of samples using the techniques of molecular biology, through crystallization, diffraction data collection, phase determination, structure validation and structure analysis. Although the book is written for experienced scientists, it is recognized that the reader is more likely to be a biologist interested in structure than a classical crystallographer interested in biology. Thus there are chapters on the fundamentals, history and current perspectives of macromolecular crystallography, as well as the availability of useful programs and databases including the Protein Data Bank. Each chapter is written by an internationally recognized expert. The International Tables for Crystallography are jointly published with the International Union of Crystallography. Each print volume can be purchased individually. In addition the complete set of Vol A-G is available both in print and online (see right hand column). International Tables for personal use can be purchased at a discount. Contact Customer Service for further information and to place an order.